Above.com Parking Manager is the ultimate solution for domain portfolio holders, to maximize revenues and increase productivity. The program provides reporting from parking companies in one single interface that is easy to use. The Parking Manager combines all domain statistics in one place, providing you with the ability to view and compare results. 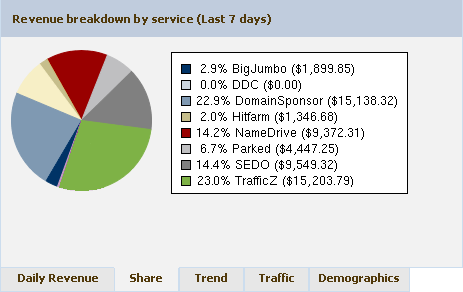 Above.com Parking Manager provides you with detailed statistics on daily revenue, traffic and demographics which enables you to monitor the performance of your domains. Your Above Parking Manager account can be customized to suit your domain choice. You are able to use your existing parking accounts with Above and maintain a direct relationship with each individual company. Your parking companies will continue to pay you directly. The system keeps your domain parking performing at its best by redirecting 5% of the traffic to other parking services to test results. If, during a trial, the other parking service yields a higher profit, more traffic will automatically be moved to take advantage of increased earnings. Above.com will monitor your domains for any decline in activity, so if a domain stops performing over a period of time, or is blacklisted; the service will automatically move the traffic to the next best performing parking service. Moving your domain portfolio and trying a different parking company can be extremely time consuming and could cause a loss in revenue, which is why, the Above.com system will identify the domains that are under-performing and suggest alternative parking platforms. When using this parking manager there is no need to change the name servers of your domains each time you want to switch parking platforms, this process is automated; which saves you time and increases productivity. Prior to Above.com you would have to manually update you name severs every time you wanted to switch parking companies. You can choose to create new accounts at other parking platforms that Above supports, it is for the user to decide which companies they want to work with. Above.com has proven to be a very successful program, with the level of revenue increase depending on the optimization and prior testing the domains have completed with other parking services; if little testing has happened previously or you are using a single service, the result will be quite dramatic. The standard Above.com Parking Manager service is free. Above does not take a percentage of your parking revenues and there are no hidden costs. To get started, simply go to http://www.above.com and create a free account!